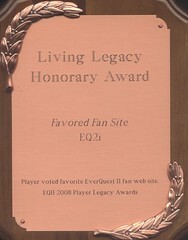 So, uhm, this wiki website for the MMORPG Everquest 2 that I’m senior administrator on won an award from Sony Online Entertainment. I couldn’t make the flight to Vegas for the awards ceremony (I only found out the week of the ceremony, darnit), but…they sent a plaque. 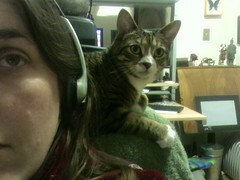 And major major props to my co-admin uberfuzzy who’s the technical brawn. If you don’t play any online games, this post will be of no interest to you. If you play EQ2, you may get a chuckle. If you play WoW, you’ll at least appreciate the whoops factor. So I was offtanking in Shard of Fear last night…. Gary Gygax, co-creator of Dungeons and Dragons, passed from this world today. Here’s to hoping he’s rolling the big dice on an alternate plane. Natural 20s to you, man. Be well and safe in your new life. If you’re not interested in D&D, skip this post. We play D&D on a regular basis, meeting with our “regular” group every other Monday night. A lot of creativity sits around that table and in an effort to promote that, I set up a group blog over at wordpress.com (group blogs at livejournal seem clunkier). Shockingly, the whole group seems to be really getting into it. I don’t know how many of you are interested or even care, but for what it’s worth, we’ve got some great writers in that crowd. The initial character backstories for our next series of adventures have started appearing if you’d like to read them. Two spells hoarded literally for MONTHS from so long ago the GM forgot I had them. One juvenille red dragon with bad saves and no spell resistence. And a GM-gifted flying owl mount with a telepathic link. Yes, I still play D&D pencil and paper games. You are currently browsing entries tagged with gaming at More Than Just the Food.